Dale’s Yogurt-Mustard Dip is great for any family gathering. This recipe calls whole white yogurt for the perfect texture for this dip. Try pairing Dale’s Yogurt-Mustard Dip with Dale’s Ham and Cheese Sliders. In a medium bowl, whisk the yogurt, mustard, honey and Dale’s Reduced Sodium blend. Next, top with green onion. 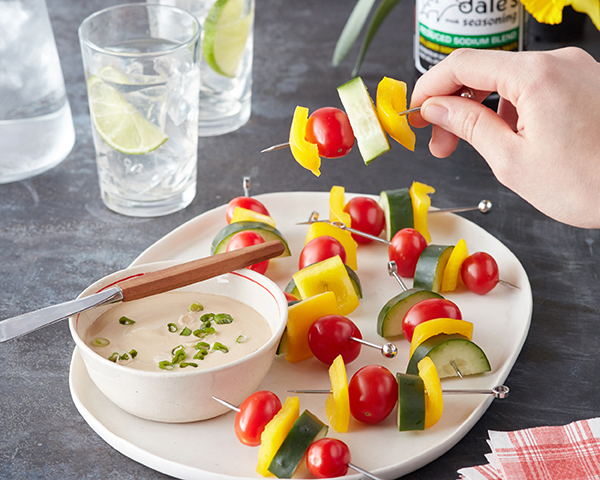 Serve alongside vegetable skewers. Place 1-2 pieces of cucumber, tomato and bell pepper onto each skewer. Finally, Serve alongside Dale’s Yogurt-Mustard Dip.